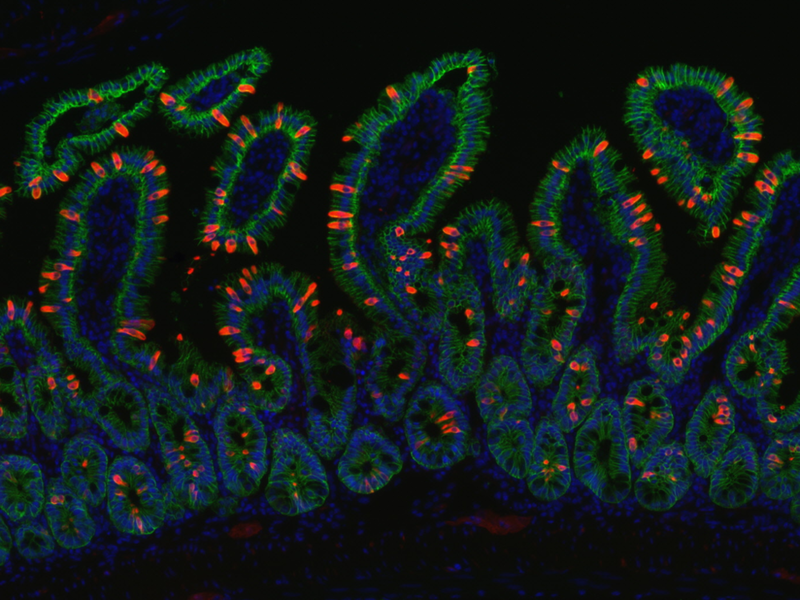 PTGS1 (green) marks tuft cells in the epithelium and hematopoietic cells in the small intestine lamina propria. Nuclei in blue. IL-25 (red) and DCLK1 (green) co-staining of tracheal tuft cells. Nuclei in blue. DCLK1 (red) marks epithelial (EPCAM+ in green) tuft cells in the small intestine during helminth infection. Nuclei in blue. IL-25 (red) and DCLK1 (green) co-staining of tuft cells in the small intestine during helminth infection. Nuclei in blue. LYZ+ paneth cells (green) and IL-25+ tuft cells (red) in the small intestine. Nuclei in blue. PTGS1 (green) and IL-25 (red) co-staining of tuft cells in the small intestine. Nuclei in blue. DCLK1 (green) marks tuft cells in a "swiss roll" of helminth-infected small intestine. Nuclei in blue. IL-25 (red) marks epithelial (EPCAM+ green) tuft cells in the small intestine. Nuclei in blue. LGR5 lineage tracing (red) and DCLK1+ tuft cells (green) in the small intestine during helminth infection. Nuclei in blue. DCLK1 (green) marks tuft cells in the small intestine during helminth infection. Nuclei in blue. MUC2+ goblet cells (green) and IL-25+ tuft cells (red) in the small intestine. Nuclei in blue. IL-25+ tuft cells (red) and EPCAM+ (green) epithelium at the limiting ridge of the mouse stomach. Nuclei in blue.